We’re a visual species, we humans. History is often learned best when its words are accompanied with charts and maps, diagrams and photos. I love looking at these pictures to get different perspectives about the events they document. 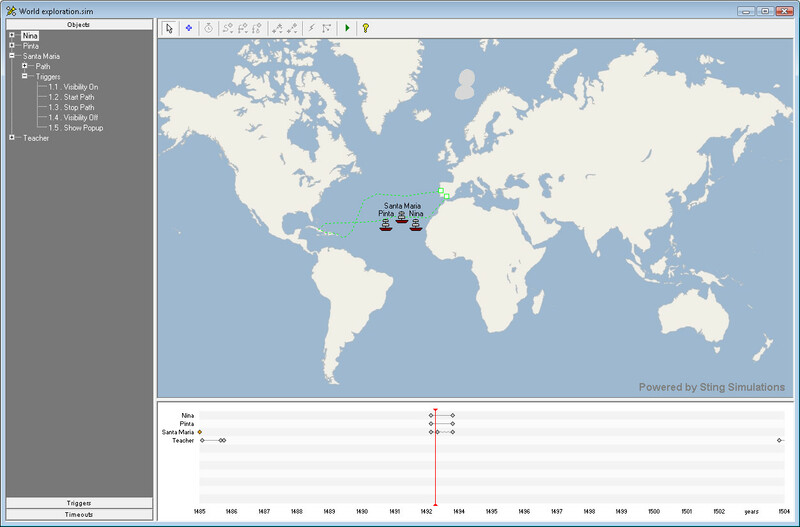 I’m a software developer rather than an historian, but I think the simulation software I’ve developed can provide another way to create context for some historical events by showing how those events unfold over time. The software is designed from the ground up to make it easy to position objects on an editing canvas and then draw paths for those objects to follow. Simulation triggers are used to configure the timing of events and actions such as when an object will start moving and how fast it will go. When the simulation is complete you can simply press play to watch the objects move around on their respective paths. Typically, the simulation will be created by a knowledgeable person (e.g. an historian) and the animated output will be watched by someone who wants to learn about the events (e.g. a student). This part of the image shows the editing canvas, to which I’ve added a background map and some objects. The map is just a screen capture of a public domain image on Wikipedia Commons, cropped to a 16:9 aspect ratio so it looks good in a video player. It is easy to add any background image using the Tools menu of the program (not shown). 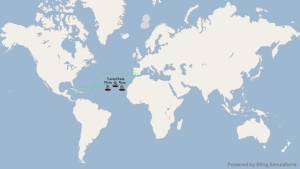 This image shows the three ships and path I drew for Columbus’ first voyage. 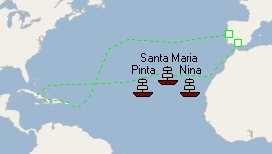 Only one path is required for the three ships since the Pinta and Nina have been configured to track the Santa Maria. These simple images are ones I created myself, but thousands of stock images are also included with the software. This image is the list of objects in the simulation. 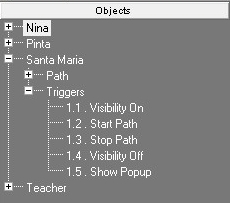 You can see that the objects are arranged in a tree, and that the Triggers branch of the tree has been expanded for the Santa Maria. Some visibility and movement triggers are created automatically when you draw on the canvas, but you can also manually add triggers, as I did to display the various pop-up windows you saw when the simulation was running. The software allows you to get different views of your simulation data. 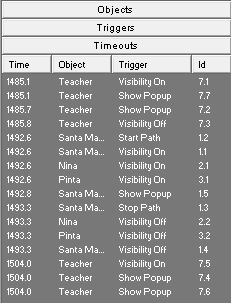 For example, in addition to the object tree, you can show the simulation triggers and timeouts as a list by clicking the appropriate tab below the object tree. The image above shows how the chronological timeout list looks when it is expanded. The simulation timeline is shown below the editing canvas. If you watched the simulation in action, you’ll note that the three ships are only visible for a few seconds. They are visible in the above screenshots because I’ve adjusted the vertical red slider to the appropriate place on the timeline. 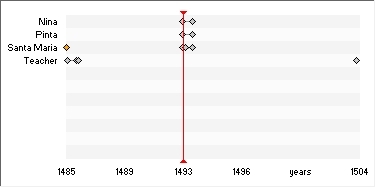 You can also see in the timeline that the timescale is shown in years. It is easy to configure different timescales, distance scales and many other options for your simulation. I hope that the demo and this overview help you understand how the software can be used to create animations for many historical events, including exploration, migration, military campaigns and battles, and so on. Such simulations can be as high-level or detail-rich as required, with the expected correlations to editing complexity and time required. In some ways creating a simulation is equivalent to creating a PowerPoint presentation. It takes some time to learn, but the process starts to speed up once you get more proficient and have some existing simulations you can use as templates. The software product is called the Yellowjacket Sting Simulation Editor and you can download and install it on your Windows computer from this link. Note that the software is publicly available but is still officially a “beta” version. This means it is entirely possible that you’ll find bugs or usability problems, for which I apologize in advance! The demo simulation in the video can be edited by installing and starting the Editor, then selecting Help, then Demos. There are several additional demos and tutorial videos on the website if you’d like to learn more. Please post any comments and questions below or email me at info@yellowjacket.ca. I look forward to your feedback. Kevin Colton is the founder of Yellowjacket Software. Yellowjacket creates affordable simulation editing software for a variety of industries including education, sports, telecom and health care. Pingback: By Jolly, I think I got it! | Digital Humanities- Kyle Garland's History Blog.